I'm pleased to announce that I HAVE FOUND IT: a Pinterest trick that actually works. I have three words for you: Mason. Jar. Salads. I know, I know. That bandwagon left the station about four years ago. But I'm dead serious, you guys, mason jar salads are a GAME CHANGER. If you follow the Fierce Mama Fitness page on Facebook, you know how much I've been raving about these things. I make five at a time. And then I eat the same salad for five days in a row. If you're not into repeating meals, this might not be as big of a game changer for you. But if you're looking for a way to get more veggies into your day, or if every day at lunch you find yourself eating the crusts off your kid's sandwich and inhaling another cup of coffee...give these a whirl. So, if I've piqued your interest, read on! All flippancy aside, yes, you obviously need mason jars. Tupperware containers won't work as well, according to the research I did (what, you don't research your salads?). 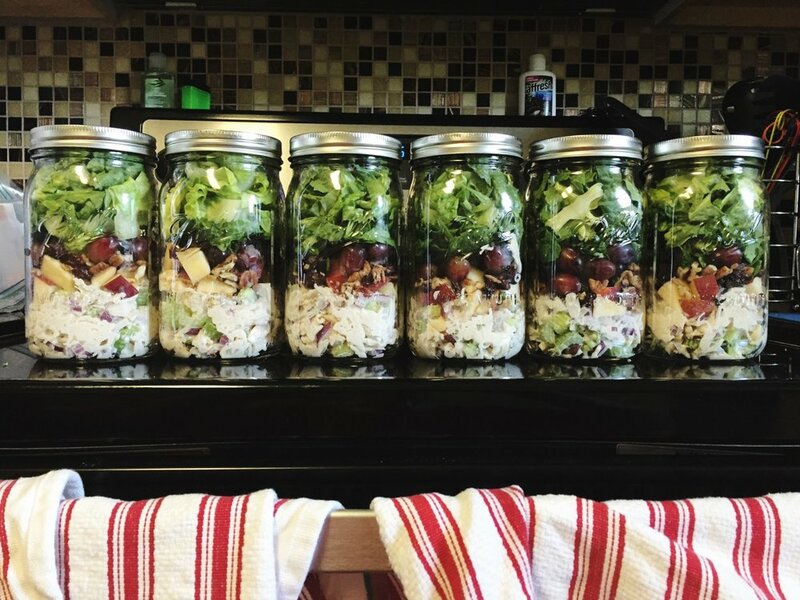 I use quart-sized jars and they make MASSIVE salads. If you want to make side salads, or you don't want a salad that could also be served in a bucket, you might want to try pint or pint-and-a-half size jars (affiliate links). PRO TIP: Make sure you get WIDE-MOUTH jars, no matter what size you're using. Otherwise you'll have a heck of a time getting your salad in and out of the jar. The first step is to decide what kind of salad you want. When I was reading all about mason jar salads, I went on a pinning frenzy and pinned all the best giant salad recipes that I could find. Some of them are mason jar salad recipes; some of them are regular salads that could easily be assembled in a mason jar. Check out my pinboard here to get some ideas of your own. Plenty of protein and healthy fats. I don't want to be hungry again an hour after I eat it, so it needs to be a complete meal. Interesting! Lettuce, carrots, chicken, and some dressing is just not something I can face for five days in a row. Give me flavor! Give me crunch! Awww yeah. I've tried three recipes so far for my mason jar salads and they are all, in my humble opinion, DA BOMB. Ok, I've got my recipe. Let's do this! You'll definitely want to block off at least an hour to prepare your salads, maybe two depending on the complexity of the recipe. The chicken, pecan and apple salad, and the Thai chicken salad both took closer to two hours to prepare because there was sooooo much chopping and prep work involved. I know this sounds like a huge amount of time, but when you consider that all you have to do for lunch for the ENTIRE WORKWEEK is literally dump your salad onto a plate...two hours really isn't bad at all. Not for five meals. If you want to save time, you can get pre-chopped or pre-shredded everything. Lettuce, cabbage, carrots, chicken, etc. It's pricier to do it that way, but you'll save a lot of time, so it's really your call. 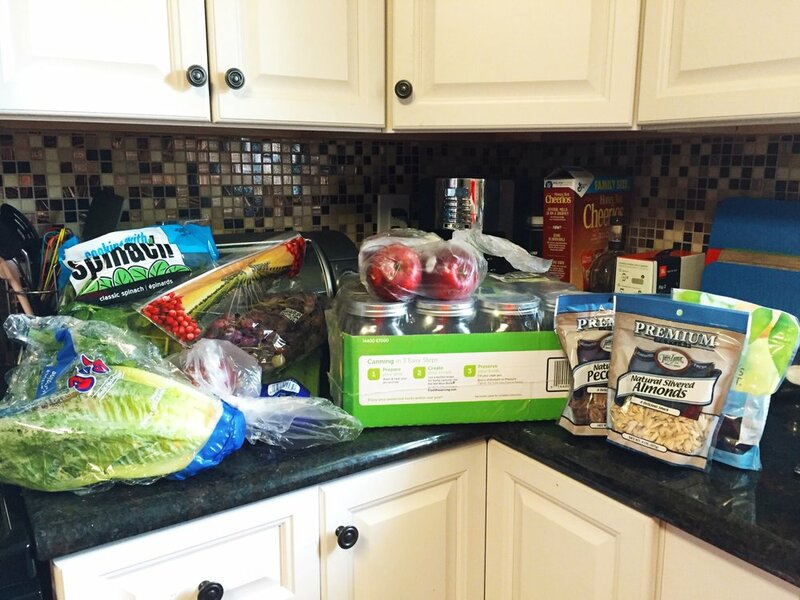 I'm working on keeping our grocery budget down, so I went the slower, cheaper route for most things. Ingredients that you'll need for mason jar salads. Step 1: Cook your protein. I've only done chicken so far, but you could totally do a taco salad with ground beef or something like that. If you are cooking chicken, here's my best tip: boil it. I know, boiled chicken sounds absolutely unappetizing, right? But trust me. If you drop a chicken breast into a pot of boiling water, it'll be cooked through in roughly 15 minutes, depending on how big it is. And since you'll be shredding it anyway to put in your salad (at least, that's how I prefer it), the texture isn't really an issue. So you can drop it in the pot and get a really good start on chopping your veggies and not have to worry about monitoring the chicken. Yes, your kitchen will smell like boiled chicken for a little bit. FYI. Step 2: Chop all your veggies and other fixings. Keep your leafy greens separate from the rest of the veggies! This is super important. Don't toss them all in one big bowl as you go along, or else your lettuce will end up kind of slimy by the end of the week. Step 3: Layer those bad boys! This is where the magic happens. How you layer your salads is critical to keeping everything fresh and delicious for five days. Dressing goes in first! In the picture below, I don't have any dressing but I do have chicken salad, so that went in the bottom of the jars. You want your jars to be layered with the driest ingredients on the top and the wettest on the bottom. Hardy veggies like cucumbers and tomatoes go in next. Really anything that can sit in dressing and not get soggy and gross. For my chicken, apple, and pecan salad, that meant putting my chopped apples and whole grapes on top of the chicken salad. Misc. toppings after that. Nuts, cheese, corn, black beans, anything like that. Leafy greens on top. Lettuce, spinach, cabbage, etc. You can fit a surprising amount of greens in the jars, so don't be afraid to really pack them in there. I used fresh herbs (cilantro and basil) in the Thai chicken salad, and I put those at the very top of the jar. Step 4: Seal 'em up! Make sure your lids are on tight. Keeping any extra air out is super important. Step 5: Admire and 'gram it. Question: if you make a mason jar salad and don't Instagram it, did it actually happen? No, of course not. Seriously, how pretty are these things? As fun as it is admiring your salad collection in the fridge, it's even more fun to have a delicious, filling, restaurant-quality salad on your plate and ready to go in your belly in literally one minute. Chicken, pecan, and apple mason jar salad. Step 7: Show me your salads! You've seen my salad Pinboard, now show me yours! Tag me on Instagram (@alexishelmrath) so I can see your lovely, nutritious creations!